Our CEO visited our Tanzania projects and tells us of his time on the ground. This blog sees him reunite with old friends. If you’ve missed it, catch up on Part 1 here. An early morning wake-up call thanks to the loudspeakers from the mosque just around the corner from our hotel. We know this routine from many stays at Hotel Flamingo over twelve years! It starts at 5am and last 15 minutes; the call to prayers! One has to admire the dedication of those who respond daily to this invocation. For us, once finished it effectively means we can pull the sheets up and fall back into dreamless sleep for a blessed two further hours! The morning was spent in Arusha, taking our old bearings and spotting countless new developments with mini skyscrapers, partially built and mostly empty. Were these hotels, offices, flats? It was never clear. Bur among them were old haunts, still doing business; Via Via cafe, the Bakehouse, McMurdos and the usual crowd of hopeful sellers of maps, prints and hats near the Clock-tower. The main streets were mostly unchanged, grimy, rubbish strewn and with numerous street sellers. But where were the tourists? The normal flourishing trade has been decimated by factors including ebola (never present in Tanzania, but an imagined fear of tourists), the economic situation and changes in the safari business. Next, was another trip to Ngaramtoni for a meeting with our team. Area Supervisor, Erneth, was waiting for us with her two Community Counsellors, Rebecca and Stella. David Kinisi joined us as we drank chai at the New Sahara Cafe, for many years the Mondo meeting point, and were briefed on the progress of recipients in the area. Sadly the cafe burnt down two years ago and is only slowly returning to normal. It is a long way off the glory days of the past! Having started the programme in Ngaramtoni back in 2005, there are more than 300 ladies working across this area and we were off to visit several of them who were selling their wares at the Sunday market. Our first call was on Sinyali, aged 49. She sells cooking oil which she decants from a large drum into coke and sprite bottles. Full of cheerful good humour, she told us how well her 3 children were doing. 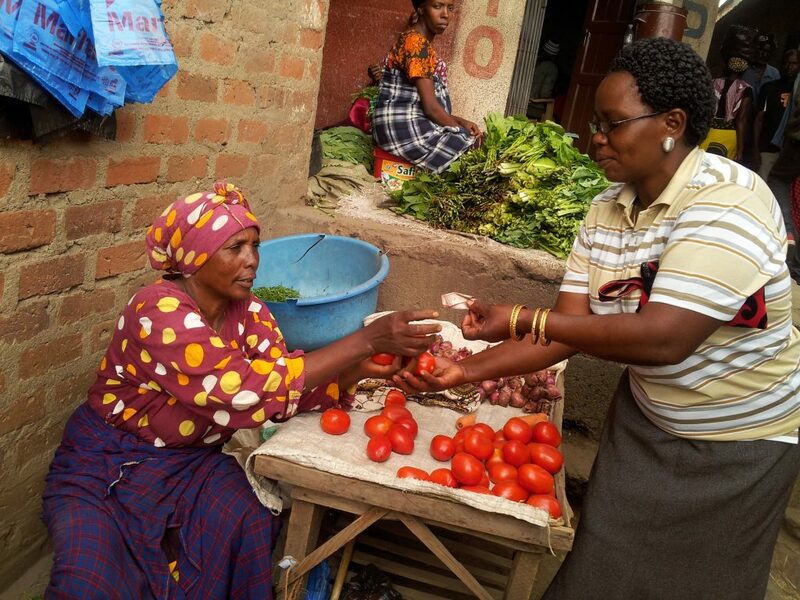 She may request an expansion loan as she thinks she can get a stall at a neighbouring market. Next we visited Esta who sells tomatoes. As so often, she was located close to half a dozen other tomato stalls. Safety in numbers! But there were subtle differences in shape and size. A visit to Anna was particularly welcome as she was one of the original recipients.Â She has grown her business with help from her sister. Originally selling firewood, she has evolved this into a carpentry business! 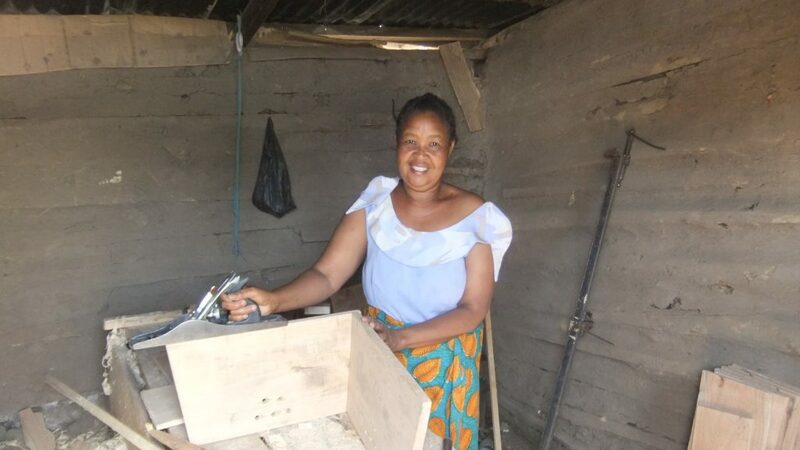 She makes gift boxes and small furniture, having benefitted from two top up loans. These loans are valuable to help successful businesses grow. They are pitched at around £200 and are repayable over 6 months at 10% interest. 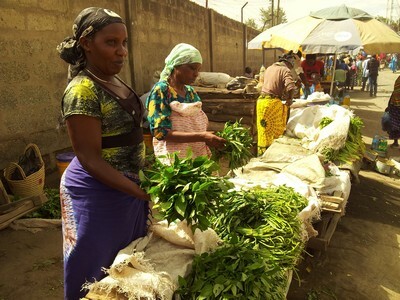 It is hard for individuals, particularly women, to get access to finance in Tanzania as the traditional micro-finance operations start at much higher figures and require security of the kind none of our recipients possess! We visited a couple more ladies in the market before the clouds burst open and it poured with rain. The market, a huge sprawling affair stretching over a mile of dirt tracks, came to an end as stalls were covered with tarpaulins and buyers ran for cover.